Whether you call it gravy or sauce doesn’t really matter, what does matter is that it tastes really GREAT! Maybe I’ve taken making Sunday sauce to the extreme, but I have a ritual of sorts which brings me right back to my best childhood memories. It all began at a place we affectionately called “the back of the store.” The kitchen behind my grandparents’ butcher shop was where our entire family gathered ritualistically every Sunday – as well as most other days – for great food and lively conversations (sometimes too lively), and always ended with playing cards, cigars outside, espresso and anisette. 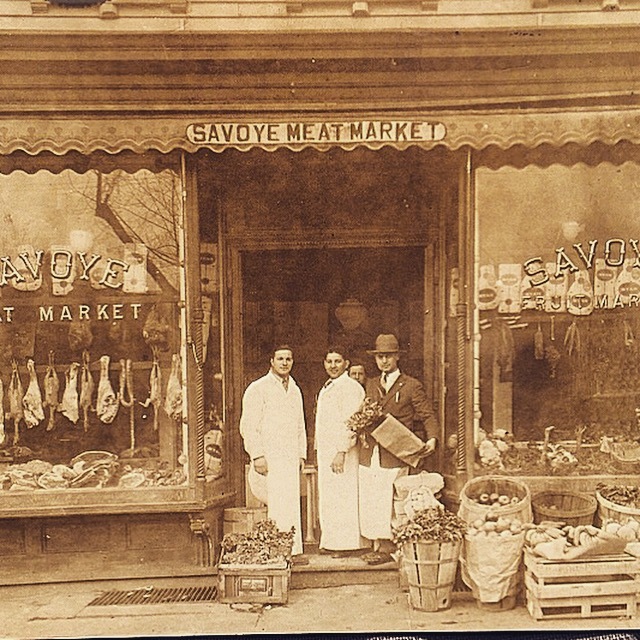 My grandpa Louis Napolitano (middle) in front of the Savoye Meat Market on Kennedy Blvd. in North Bergen, NJ sometime around 1930. In an effort to pass tradition to my children, onions and garlic don’t hit my pot until I have certain must-haves in place. So let’s set the mood! 1. I set my Pandora station to Traditional Italian Radio. It plays all the classics – Dean Martin, Frank Sinatra, Louie Prima…You get the idea. 2. Get on your favorite apron. 3. Pour yourself a jelly jar glass of your favorite wine. My favorite is Cabernet Sauvignon. 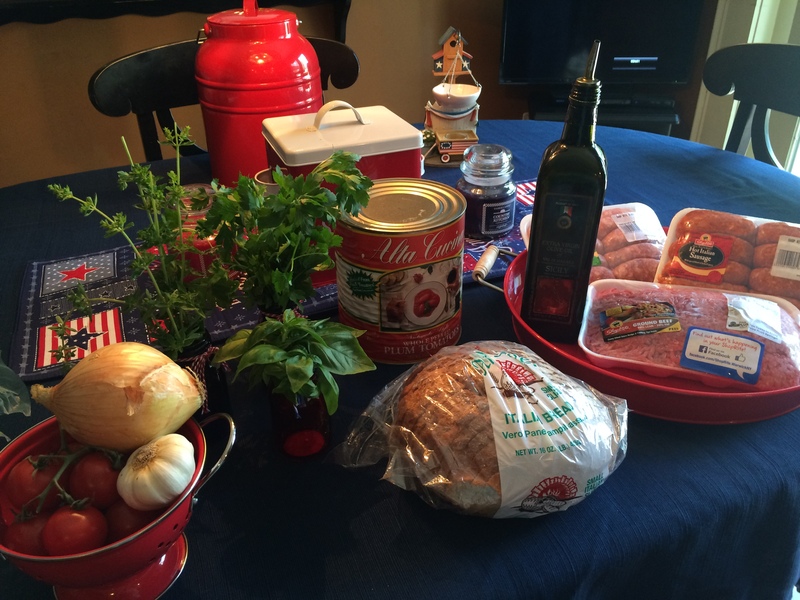 Now we’re ready to start cooking! Trust me, this is going to be fun! 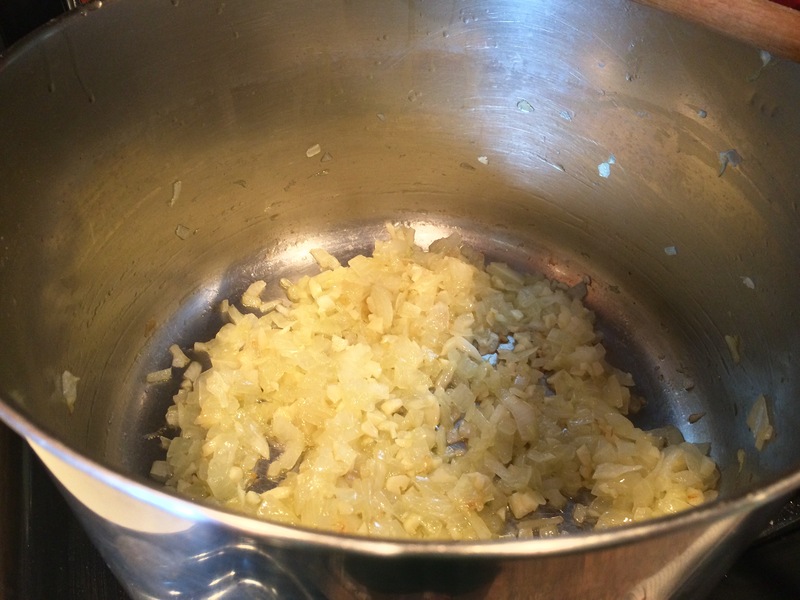 In a huge pot (I prefer stainless steel) on medium, saute onion in olive oil. When the onion is translucent, add garlic (Be careful not to burn or you will need to start again). Saute until fragrant, about 1 minute. Add the crushed tomatoes, paste, water, 1 can’s worth of red wine (the other is for deglazing the meatball and sausage pan later), brown sugar, and allspice. 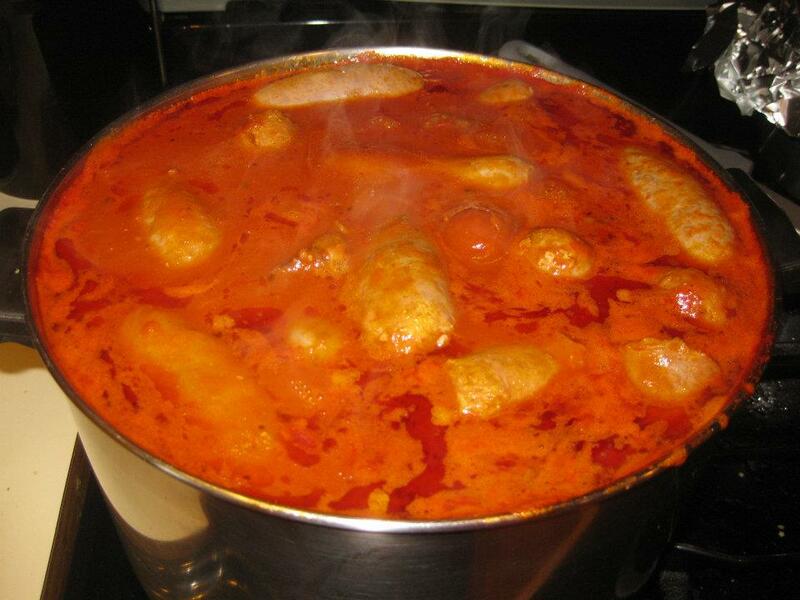 Let simmer on low while preparing the sausage and meatballs. Heat up a large frying pan on medium-high. 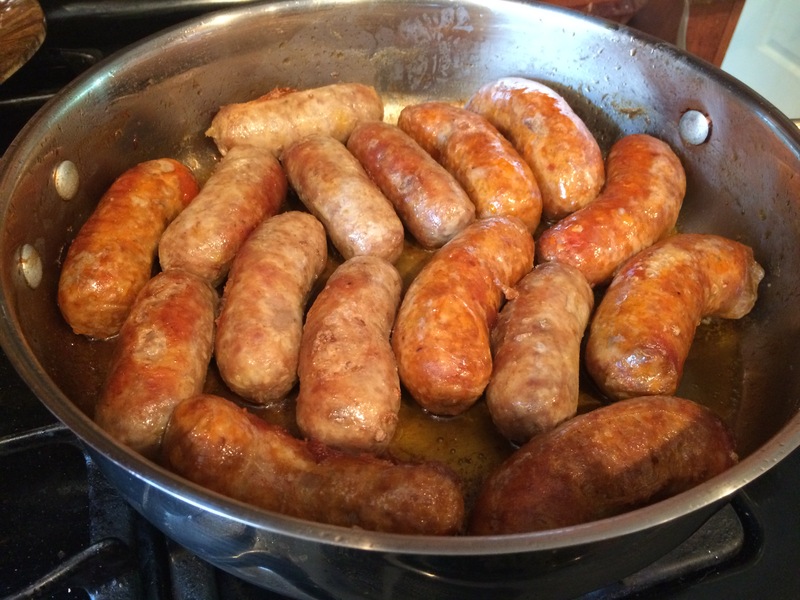 Put the sausages in a large frying pan and add enough water to just barely cover them. Heat the water until it boils then lower to medium for 10 minutes. Drain the water. Now, in a new pan, add 2-3 tablespoons of olive oil and brown the sausages. Once they are browned, cut the hot sausages in half and leave the sweet sausages whole (this way you can tell which are which). Remove sausage and set aside. Don’t wash the frying pan, we will use the same pan to cook the meatballs. Ribs are optional, but the pork adds really great flavor. My grandfather used to add different cut of meat he had available for different flavors – everything from ribs to braciole to tenderloin. It’s really simple: Just brown, and add to the sauce to give it a little something different. The more meat, the better. Place all ingredients into a large bowl and mix (You could use a wooden spoon, but I just get in there with my hands). Shape into medium-sized balls. 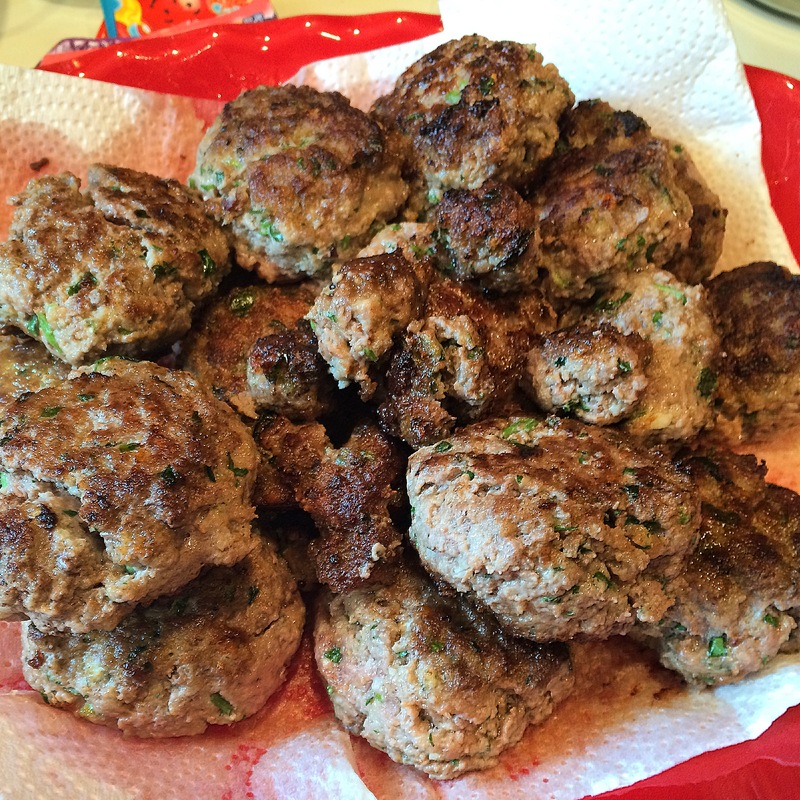 I use an ice cream scoop to make the meatballs a uniform shape, then roll them into a ball with my hands. I also like to make a few mini ones (I like to call them “testers” – nothing will ever taste better). Take the last can worth of wine (6 oz.) and deglaze the pan of all the delicious bits and add to your already decadent simmering sauce. (Deglazing is just a fancy term which means to add liquid to your pan so you can loosen and use every morsel of browned food to your dish). Now add all of the meat back into your pot with the sauce. Add parsley and turn down to low. Let sauce simmer until done, about 3-4 hours. Tasting is always encouraged, and this is where you can make the recipe to suit your own tastes. For example add salt, pepper, red pepper for spice, other browned meats, extra wine, etc. Of course tasting with fresh Italian bread is always a good way to go…quality control of course! Serve over your favorite pasta (I use thin spaghetti or rigatoni), and top with grated Parmesan if desired. Enjoy! 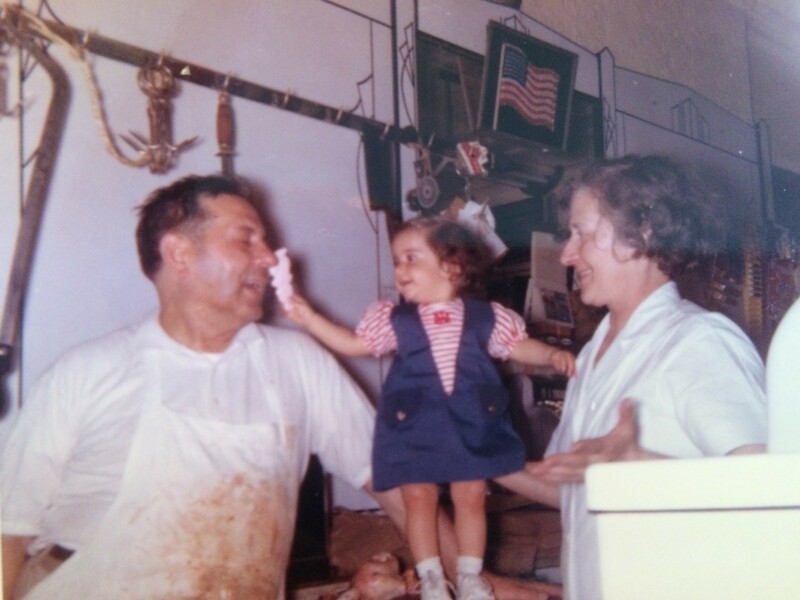 Me, my grandpa (left) and my Grandma, who we called Grandma-Ma, about 1965. Great post Mary! I’m so glad you are finally sharing your great cooking and awesome stories 🙂 And I love the pics! Hi Mary! I hope you remember me Diane Singhofen-Chervony and my husband Jerald Chervony, and his sister MaryAnn because we certainly remember you, your grandma (Marie), grandpa (Louie)…your whole family including Abby Lane and Tuffy. Wonderful, wonderful memories of that store. My mom (Ann) and Jerald’s mom (Louise) shopped many times there. I remember Louie made THE BEST SAUSAGE SANDWICHES in the world and Marie made me the BEST ham and cheese sandwich..as a matter of fact, I go to Fiore’s in Hoboken and they come close to your Grandma’s! We have so many fond memories that came back to all of us when I saw your post. Is the recipe for gravy with sausage you posted from Louie? We certainly hope so! Hi Diane! Of course I remember you! 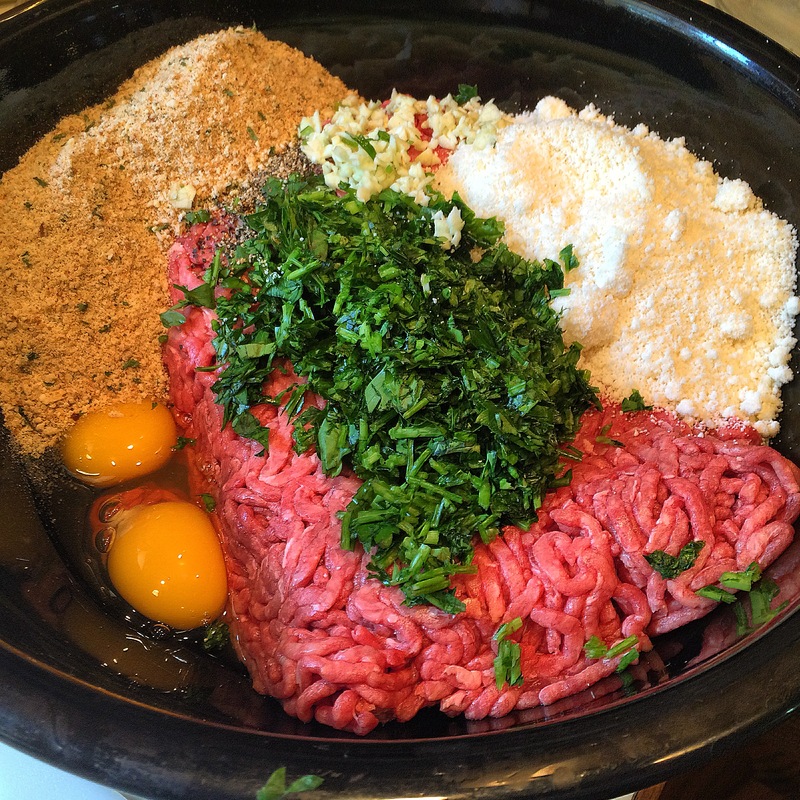 So many great memories from North Bergen!The recipe is my own, I’m not sure it could ever be as good as my grandfather’s, but give it a try and let me know!